Set in one of the most beautiful and stunning locations in the country, the Tulfarris Hotel & Golf Resort is a haven for great service, accommodation and food. Just 45 minutes from Dublin city, and close to the motorway, Tulfarris is ideally located on the shores of Blessington Lakes with the dramatic Wicklow Mountains as a backdrop. Whether it’s for a family meal, a couples dinner, a business brouhaha or an occasion with friends, the Tulfarris Hotel has is the perfect spot. Their fab contemporary Limetree Restaurant is proud to assure their diners that, from the freshest veg to the most flavoursome meat, they strive to keep their kitchen as locally sourced and organic as physically possible. 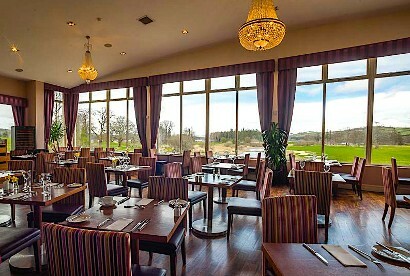 The cuisine here is modern Irish with lots of influences from around the world, and, with a spacious dining room and light tasteful décor, not to mention the large windows with their fantastic views of the stunning golf course and the natural beauty beyond, the atmosphere in the Limetree is relaxed and uplifting from starters right through to dessert. Starters at the Limetree, on my visit, included Five Mile Town goats cheese with walnut crumble, beetroot, poached pear and crispy sage; corned beef and cabbage terrine with wholegrain mustard, pickled onions and brioche; as well as their Chef’s homemade soup of the evening with brown soda bread. I quite fancied the Irish oak-smoked salmon which was so tasty and fresh with delicious blood orange, fennel, radish and cured beetroot. Meanwhile, friend Mary happily cleared her plate of natural smoked haddock with leek fish cake a poached hen’s egg and mojo verde. There was lots to choose from on the mains, with a pan-seared darne of Atlantic hake served with pomme mousseline, baby spinach, charred cauliflower and beurre blanc; and a baked supreme of Irish chicken with parsnip puree, wild mushrooms, button onions, smoked bacon and Madeira jus easily making our shortlist. In the end, I opted for a slow cooked belly of pork which was simply delicious with Jerusalem artichoke, kale, black pudding bon bon, terrine and apple jus, whilst Mary stuck with the fishy flavours choosing the grilled fillet of sea trout which proved a fine tranch accompanied by champ potato, baby spinach and sauce grenobloise. With still a little room left on board, we perused the desserts which tempted us with notions of dark chocolate, cherries and crème brulee. We decided to share a toothsome order of warm sticky toffee banana and pecan pudding, a sweet tooth delight with its tasty rum and raisin ice-cream. If you fancy a more casual bite, then go check out their Elk Bar. A fab meld of old world hunting lodge, with mounted elk heads and an open fire, meeting contemporary cool; the Elk Bar, with its big fashionable marble-topped bar, is the perfect place to enjoy a relaxing bite whilst looking out across the fairways of Tulfarris’ fabulous 18-hole championship golf course. When the weather is fine, they have a beautiful terrace overlooking the 18th fairway and green as well as BBQ facilities. The menu at the Elk Bar features lots of small bites like creamy forest mushrooms on sourdough with roasted garlic cream; Clonakilty black pudding with beetroot and apple relish, winter greens and a scotch egg; as well as slow cooked pork and balsamic onion skewers with spiced apple chutney and pickled veg. They also do great salads and sandwiches, not to mention their artisanal charcuterie sharing boards and grazing platters. For a bigger bite at the Elk, their mains offer choices like a baked supreme of Glin Valley chicken with cowboy bean & chorizo casserole, bacon and garden greens; an open pan-fried 7oz flat iron steak sambo with shoestring fries; as well as their signature beef sliders with sweet potato fries.